Guess who had a birthday and turned the big 4-0 this week? No, not me but thanks for the thought (mental note, invest in some anti-wrinkle cream). It’s Barry! His birthday was on Thursday and we did it up right! The plan was for Bubbles to get Barry over to OCP (usually they work in the Annex) on Thursday. He and I were supposed to have a 7 a.m. meeting that day so it made sense for him to be in the same office. They reserved QWS rooms for the day too (otherwise he would have been dragged out to the town square and hung). 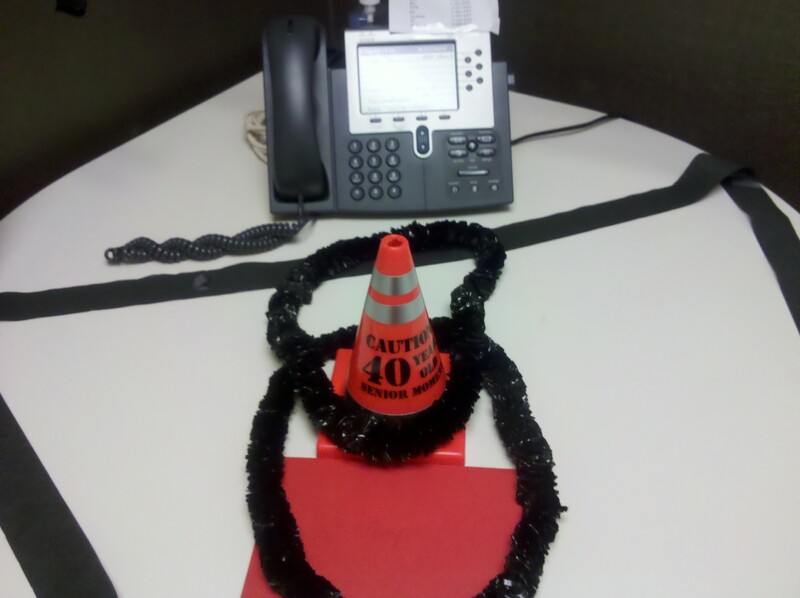 Wednesday evening before I left the office, I decorated his QWS with all kinds of stuff! 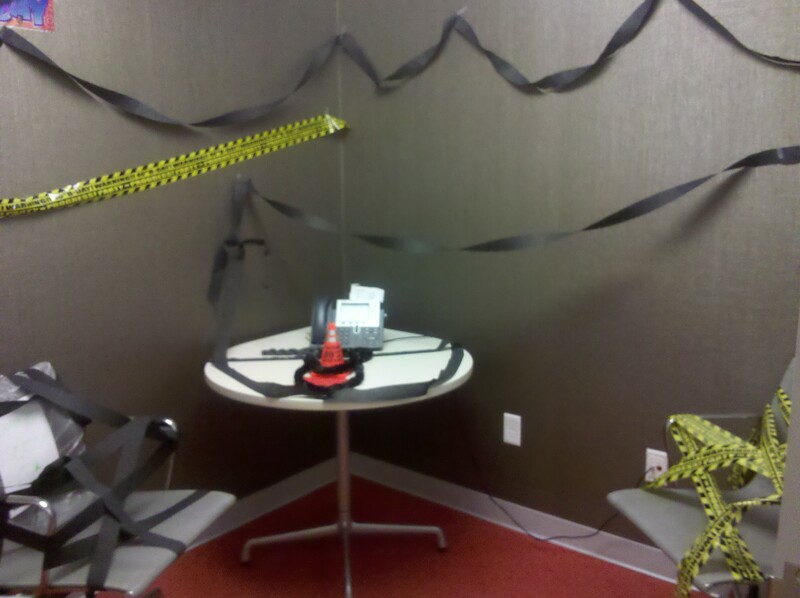 As you can see, there were black streamers everywhere, along with caution tape. I made sure to wrap each chair good too! 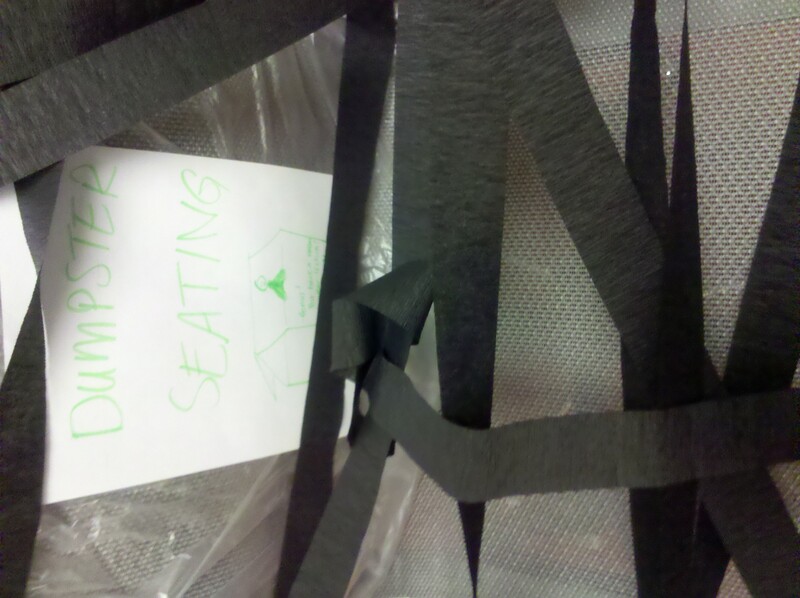 This one is covered in a garbage bag and has a sign for “Dumpster Seating”! 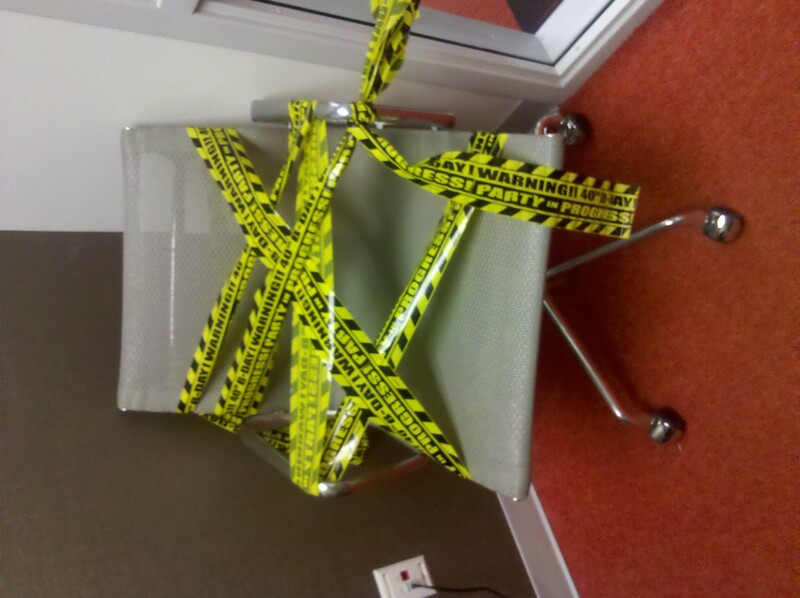 And this one is wrapped in the caution tape. On the table was a cone and some black leis along with a card that I cannot show on this website because it’s family friendly. Finally, on the door, I put a sign letting everyone know that the room was reserved. Here’s the funny thing – you all know that everyone I talk about in The OCp and Annexed have aliases. I don’t use anyone’s real name in order to protect their privacy. So, “Barry” is not “Barry’s” real name. But I put it on the sign for fun. Well, apparently, people that didn’t know him were walking by the room and saying “Hey, Happy Birthday Barry!” thinking it was his real name. He just played along. Ha! 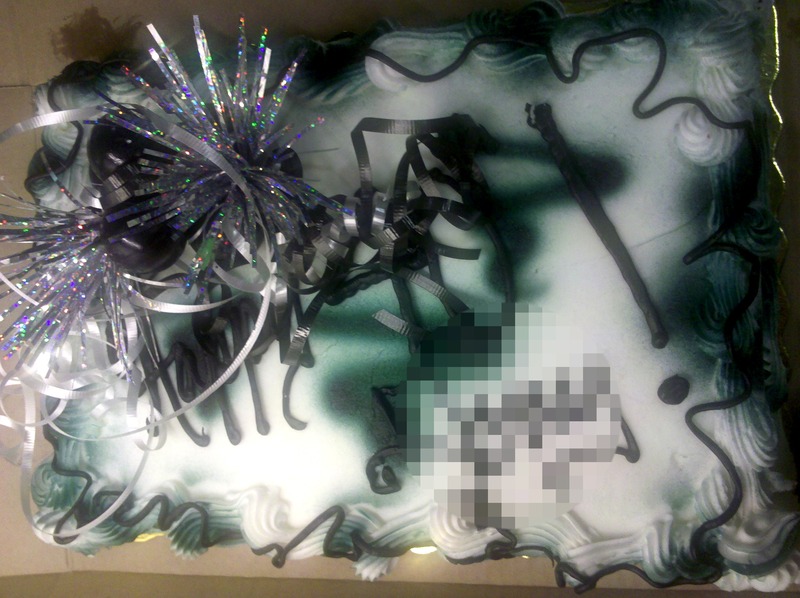 Mid-morning, we broke out the cake. Wait, mid-morning you say? Yes, that’s exactly what I said. To some, that may be too early for cake. But those people aren’t seeing my logic. See, if you cut the cake in the morning, then you have it to snack on all day long! Brilliant! Perfect don’t you think? It was yummy too. 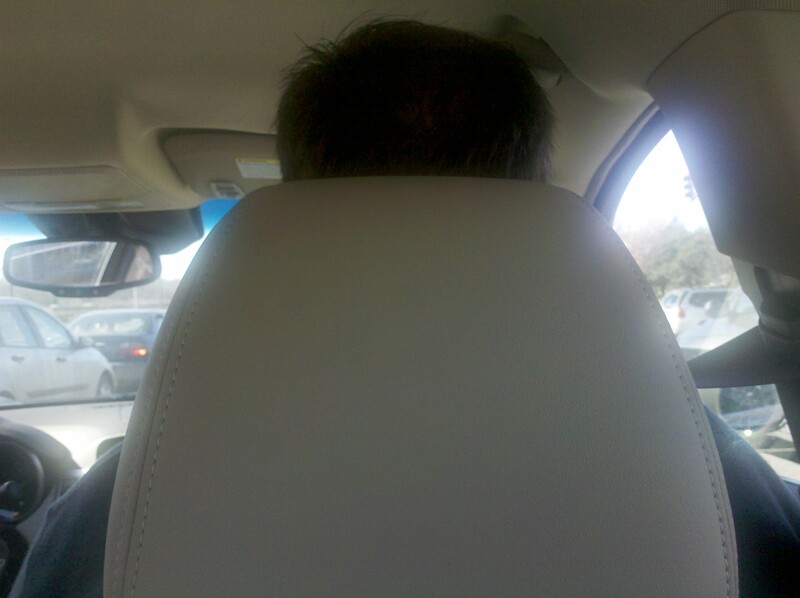 For lunch, we all went to Whole Foods again (this seems to be our new spot). Our lunch conversations take all kinds of turns. We talked about poo, travel, flying, the fact that the Queen of England refuses to potty on a toilet that’s been used by a commoner, Prince Albert (both the man and the piercing), Prince (otherwise known as the symbol) and seaweed. That’s all pretty standard stuff right? You mean that’s not what you talk about at lunch? Huh. Bob and I rode with the Brit on the way down, but she had to leave early for a meeting, so we rode with Barry and Bubbles on the way back. This meant Bob had to stuff himself (Grape Ape style) into their little car. Several of the gang went to the casino Thursday night to continue the celebration. See, Barry is a regular and has a gazillion points he can use on dinners, hotel rooms, etc. So he treated the Brit, Bubbles and Boston (our Project Manager who I don’t talk about much but he’s a real character. This week he told us how he’s a 2nd degree black belt and can break bricks and blocks with his head, hands and feet. He’s only broken about every bone in his body and knocked himself out a couple times…) to dinner. I had volleyball and Bob had to be home with the family which is why we weren’t there. Plus, between the 2 of us, we could have eaten up all Barry’s points in one dinner and we didn’t want to do that on his birthday. We’ll do that some other night. Thanks for all the kind birthday whiches….I mean wishes. Oh crap, I’m drnk. Later! PS. A big thank to my Omaha peeps too! Y’all are the best! Good times! Can’t wait to get back to Big D for more fun!!!! Whoop Whoop! Ahh! My cake from the GM lounge at Harrah’s. Now please excuse me while I stick my face in it. 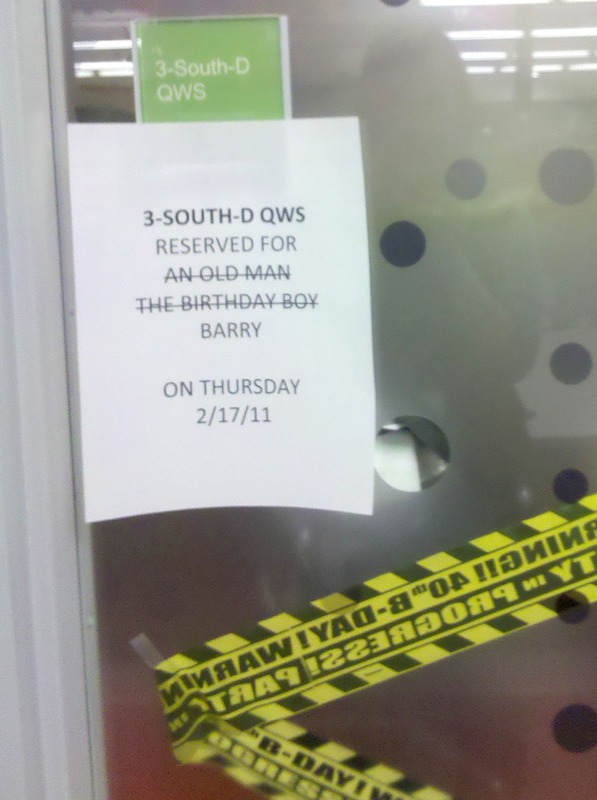 All in all, I think Barry had a great birthday and we sure had fun helping him celebrate! Guess who returned to the Annex today? Yes, this time the answer is me! I decided to work from there today so that I could join the gang for lunch at John’s and because I wanted to see the mass of hoses for myself. Turns out, they actually fixed all the leaks this week! Can you believe it? There is not one tarp tile, hose or drip to be found (except for some of the mall walkers). The only evidence that there was ever an issue are the ladders left standing against the wall. We ventured down to John’s early because we’ve discovered that Scooter eats there every day around 11 a.m. Sure enough, just as we got off the escalator (which doesn’t work so walked down it instead of riding), we heard the familiar “whirrrrrrr” of his scooter behind us. We let him go ahead and instead of going to the counter to order, he went to a table. The Brit told John that he could help Scooter first and he said, “It’s ok, he’s my brother so I can feed him whenever.” We don’t really know if Scooter is actually his brother or if he was joking. They don’t really look alike and Scooter doesn’t have a Greek accent. But perhaps he’s a step-brother or adopted or something? Who knows. We did see John bring him his plate and then proceed to pour obscene amounts of ketchup over it for him. Regardless of the nature of their relationship, it’s obvious John has a fondness for Scooter and takes care of him. Over lunch, Barry told us all kinds of stories about his family. To get the right frame of mind, think “Gone with the Wind” meets “Dallas”. It’s basically an old wealthy Southern family who owns much of their small town and has a crazy aunt/sister/daughter. In this case, the crazy one is Barry’s great-aunt, Margie Bell (again, an alias). One day a police officer pulled over a young man in front of her house. He had his lights on and was writing the kid a ticket. Margie Bell could see them from her 2nd story window and yelled out, “Turn those lights off!” The officer looked up, rolled his eyes (she was pretty well known by everyone in town) and ignored her. So, a few minutes later, she opened the double doors to her balcony, said, “I told you to turn those lights off!” and proceeded to shoot them out with her gun. She was promptly arrested. But, she made it up to the city by buying them a new fire truck. A friend of hers died and Margie Bell wanted to go to the funeral home to visit her at 2 a.m. She called over and the funeral director said no, he would see her in the morning. She insisted but he still said no. So, she got in her car (a Lincoln Mark VII) and proceeded to drive to the funeral home and right through the front doors, taking down the whole front facade. She was again arrested and made it up to the director by paying for his new building front and paving the cemetery out back. She never leaves the house without a bottle of wine, a gun and five thousand dollars. There was another story he told us about his grandmother. She was married 5 times (the first and 5th husband were the same man). Well the 3rd husband was a doctor and to help with some of her headaches, he kept giving her more and more medication. At one point, she was so doped up that she started hallucinating! Barry (who was a kid at the time) and his step-grandfather had to carry her upstairs to bed. Barry was carrying her feet and the Doc had her shoulders. She was hallucinating so bad that she thought Barry was a pig walking on his hind legs and her husband was a piece of paper. She even reached back to try and wrinkle him! Can you believe it? I tell you the stories just get better and better. Barry is going to find out a few more while at home this weekend and share them with us when he gets back. Can’t wait! That’s all for this week! Thanks for tuning in and see you next week for another edition of….